Every day, we interact with the energies and vibrations around and within us. These vibrations are varied. Some are high and positive; they bring light to our lives. Others, however, are low and only serve to drain us, leaving us feeling miserable within and irritable with those around us. As a result, it is essential that we pay close attention to the state of our auras. More often than we might like to think, we need to reset or cleanse them. This keeps us in a state of positivity, which allows us to live a life of spiritual alignment and goodness. 1 What Is A Spiritual Bath? 3 Should You use Essential Oils? What Is A Spiritual Bath? One way to care for our auras is to take a spiritual bath. If you’ve never heard of this, the most important thing you can know about a spiritual bath is that it is different than a regular bath. The primary difference is that it is a sacred ritual and must be treated as such. Before you begin a spiritual bath, planning and preparation is essential. It is best to time your spiritual bath with a full moon to fully enjoy the power of cleansing energies. Next, you’ll want to make sure your bathtub is already clean and free from any soap or oils. You’ll also want to make sure your body is clean. This bath is for spiritual cleansing, not for physical cleansing. The beauty of a spiritual bath is the unity it brings to your body and your spirit. Not only does it cleanse the negative energies from your soul, it rejuvenates your body by performing its sacred tasks on your actual skin and bone. It’s a beautiful experience, start to finish. To take a salt bath, fill your tub with warm but not hot water. Add a high-quality salt to the water, such as Himalayan salt. You can also use Epsom salt. Salt works powerfully to bring balance to your body and clings to the surface of your body, thus ensuring a constant cleansing of your aura even after you get out of the bath. As you soak in the salt bath, set an intention or removing all negative energy. This includes energy that has been shared with you by others and energy that you have brought on yourself. Soak for a minimum of twenty to thirty minutes, focused only on positive uplifting thoughts. Once you’re done with the salt bath, step out and resist the urge to towel dry. Allow your body to drip dry, if at all possible. Salt baths should only be taken at maximum once a week, but preferably once a month. To recharge your positive energies with a baking soda spiritual bath, simply add about a cup of baking soda to warm, not hot, water in a bathtub. As you soak in the warm bathtub, you will experience the multiple gifts of baking soda spiritual baths. Baking soda baths are powerful agents of detoxification for the body. 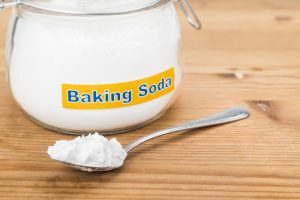 Baking soda not only goes to work on your skin, removing dead skin cells to reveal baby soft skin, it also enters your pores and removes toxins from within your body as well. It is also a power agent of cleansing for your aura. Like with the salt bath, you’ll want to set an intention or say a prayer as you soak for twenty to thirty minutes. Release the power of negativity and ask for your mind and body to be filled with the positive vibrations of a beautiful and clean aura. Apple cider vinegar baths have long been associated with healing illness. They’ve been known to shorten the length of a cold or flu. They are well known for adding vitamins to your body through the entrance of pores as you soak. However, apple cider vinegar baths are also powerful aura cleansers. 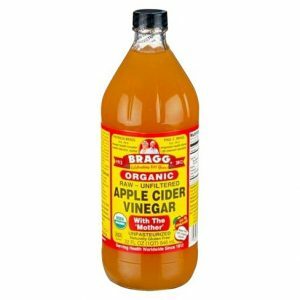 By adding just a few drops of apple cider vinegar to your bath, you can experience the unified power of healing and purifying of both body and spirit. 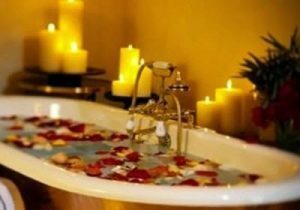 Similar to the above mentioned spiritual baths, while the physical benefits are wonderful, it’s the cleansing of the spirit that you want to focus on. TO do so, meditate or pray, set an intention or focus on your breathing. Concentrate on the positive and beautiful things in your life, building your reserve of positive energies and releasing the negative. While it’s true that to ritualize a spiritual bath, you want to make sure your bathtub is free of all soap and oils, this isn’t true of pure essential oils used for aromatherapy. Essential oils are a welcome part of a spiritual bath is you are powerfully and positively moved by scent. Lavender is a safe and calming oil that blends well with salt, baking soda, and apple cider vinegar. It relaxes both your body and your mind and builds a solid bounty of positive energy in your spirit. Spiritual baths are an important part of properly caring for your aura. As you ritualize them, you’ll find a more consistent and elevated spiritual energy.